I love reviewing data and I'm not ashamed to admit it! Immersing myself in bar graphs and pie chart gives me a rush. Oh yeah! I'm being dramatic, but you get it. I love data! Examining data and analytics can be boring for some because no one wants to look at numbers that don't make sense. Am I right? Well while some data can be boring, it's essential to review it because it gives you an objective insight into how you're performing. My Twitter goal for August was to increase my engagement and followers. I accomplished this goal by spending more time on Twitter (retweets, quoted retweets and faves), participating in Twitter chats and leveraging the relationships I developed in a few Facebook groups. My Twitter activity paid off. 4% of my blog's traffic came from Twitter, previous month was 1%. My goal for September is to continue to improve how I use Twitter by reviewing its analytics. Twitter analytics is free data that gives unique insight into your followers and engagement. Here are some areas you should pay attention to when reviewing your Twitter analytics. In the summary section below, you can see there is a direct correlation between the tweets, impressions (the number of people who see your tweet), and follower growth. In August, I tweeted an average of 11.2 times per day. More tweets led to increased impressions which attracted 403 new followers; my largest follower growth to date. Amazing achievement when compared to the modest growth I experienced in June and July (see charts below). 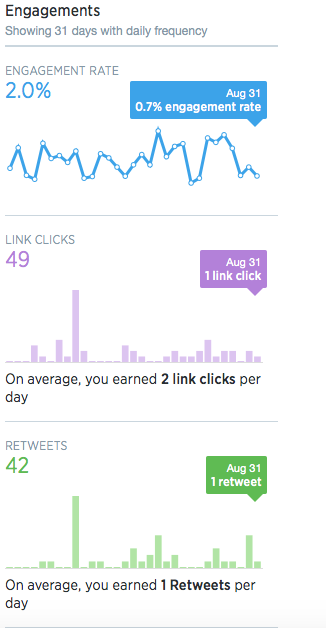 The engagement dashboard shows the average engagement rate, link clicks and retweets. Great information, if you're trying to gauge how often your audience interacts with your tweets and which posts resonate the most. I want to know if they are responding to my call to action; which can be measured by link clicks and retweets. Learn more about your followers. Audience insights can be drilled down by demographics, interests, lifestyle and more. Twitter shows you the top 10 interests of your followers. As you can see in the chart below my audience's primary interest is marketing which makes sense because that's my area of interest as well. Examining audience insights can also provide you with content ideas for future blog posts. Track your organic reach to learn which days your tweets yield a higher impression. You can also sort the per tweet data by top tweets, tweets and replies as well promoted tweets, if you run ads on Twitter. This gives you a quick snapshot of your tweets' impression and engagement. You can get real-time engagement data...isn't this great? It's important to review your Twitter analytics because it allows you to identify what resonates with your audience. More importantly, it gives your insight into your audience's interests. With these details, you no longer have to speculate as to why your tweet aren't performing well with your followers. Perhaps what you tweet about doesn't align with their interests. If you find that this is the case I would strongly recommend using hashtags to ensure that your tweets reach your ideal audience. If you're not getting the results you want on Twitter, you should consider tweeting more often. Have you reviewed your Twitter analytics? Go to anaytics.twitter.com to access it now. As always leave a comment I would love to read your thoughts. Don't forget to share!